Live the life of a woodland creature in this exciting game. Click here to play! If you can scavenge the most nuts before winter comes on, you'll be sitting on a small fortune! Clamber to the tops of the trees to grab the coveted pinecones. These are a major source of nutrition as they act as wild symbols and will replace all most all other symbols to help you create more winning combinations. Your furry friends will also help you cash in. Spin three to five busy beavers and you'll get up to 300 times your line bet. Three to five chipper chipmunks will get you 150 times your bet, and lazy raccoons can score up to 100 times your bet. There are plenty of others there to help you out with K's, Q's and J's bring in the most profit. 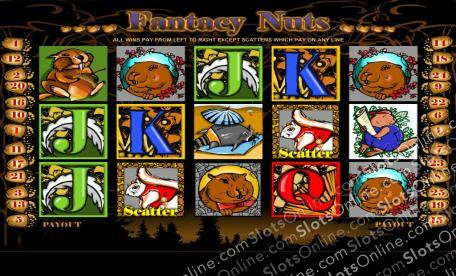 As you're after the nuts, you'll want to be sure to get the walnut scatter symbol on selected reels for a chance at free games. Mushrooms are also pretty important in your search for food. This bonus symbol on selected reels will get you a bonus game in which you can play for some pretty great prizes. So, scour the forest for a chance to bring home the nuts! The tasty walnuts act as a scatter. If you spin them on reels 1 and 5, you'll be rewarded with five free spins! The pinecones act as a wild symbol. It will replace all other symbols, excluding scatters and bonuses, to help you create more winning combinations. The mushrooms will trigger the bonus feature. Spin this symbol on reels 2, 3 and 4 in an active pay line and you'll trigger a bonus game that lets you choose from a selection of golden nuts to reveal a bonus prize.